One of the most influential films of the 90s, Wayne’s World, is coming home to Aurora, IL this spring and doing so in full force. The film put the Chicago suburb on the map so to say thank you for that lasting legacy after 25 years the town will be hosting a variety of interactive events that celebrate all things Wayne and Garth. Those of you not in Chicago can still party on with a special presentation of Wayne’s World in theaters nationwide on February 7 and 8. Check your local theaters for more details. 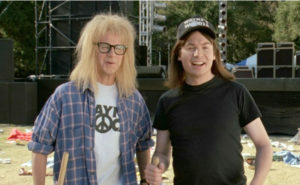 Search for life-size cutouts of Wayne and Garth throughout downtown Aurora, take a selfie and share your pictures on social media with the hashtag #partyonaurora. February 3 from 7-11 p.m. at If These Walls Could Talk, 32 S Stolp Ave, Aurora, IL. February 3 during First Fridays in downtown Aurora. February 22 at 7:30pm at Two Brothers Roundhouse, 205 N Broadway, Aurora, IL. March 3 during First Fridays in downtown Aurora, IL. April TBA at Luigi’s Pizza, 732 Prairie St, Aurora, IL. May 29 at 7 .pm. at the Paramount Theatre, 23 E Galena Blvd, Aurora, IL. July 4 before fireworks at RiverEdge Park, 360 N Broadway, Aurora, IL.